Dr. Silva-Celada graduated from Inter American University of Puerto Rico. 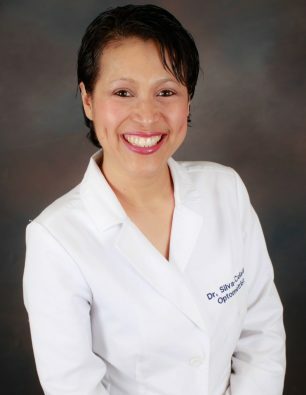 Dr. Sharon Silva-Celada received her Doctor of Optometry degree in 2008 from the Inter American University of Puerto Rico, school of Optometry. She graduated as the top student from her class. She has experience in family eye care, including dry eye management, computer vision problem-solving, children’s eye examination, contact lens fitting, eye surgery co-management, and diagnosis and treatment of ocular diseases such as cataract, glaucoma, macular degeneration, diabetic and hypertensive retinopathy. Dr. Silva-Celada loves to offer her services to the underserved community and has traveled to Dominican Republic along with a group of eye doctors to provide free eye examinations and eye wear. She also volunteers in different programs that provide optometric services and glasses to uninsured children in the LA area. Her desire to serve the community continues with her constant work in different health fairs across the San Fernando Valley. She is state licensed in California and New Mexico, and is board certified in ocular pharmaceutical agents, open angle glaucoma treatment, and minor surgical procedures for the optometrist. Professional memberships include the American Optometric Association, Women in Optometry, and the Ocular Nutrition Society. She has been listed twice as “Top Optometrist” by the Consumer’s Research Council of America and has been the recipient of the Gas Permeable Contact Lens Clinical Excellence Award.